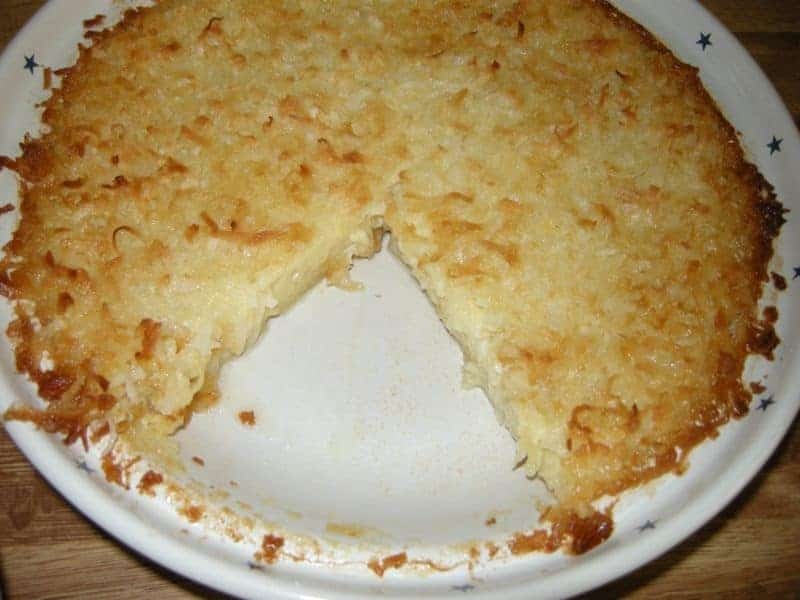 Mama’s Amazingly Easy Coconut Pie is truly amazing. Delicious and Easy! Today, I am bringing you a very special pie, for many reasons. For one, it is one of my mother’s favorite pies to make and one of my favorite pies for her to make for me! Another is the personal story behind this pie, which does get a bit depressing. So much so that I am actually putting it at the bottom of this post instead of at the top. For now, lets just talk about the pie. This is one of the classic “impossible” pies which Bisquick came out with. Now, I’m not a Bisquick fan. 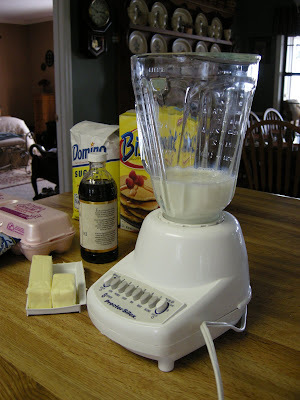 I actually use Pioneer brand baking mix whenever a recipe calls for Bisquick. Why? Its simple: The packaging. The messy cardboard box with the tear open lid has long been left in the dust by the canister style box with the sealing plastic lid. With others, you either have to transplant the entire contents, try to stick the box into a large plastic bag, or just deal with this open box of powdery mess being knocked over repeatedly every time you have to reach for something near it ( My y pantry is not a safe place at times). Pioneer never looked so good. There are also come great recipes on the web for homemade baking mix, and I am determined to try them first chance I get! Want to know the really cool thing about this pie? 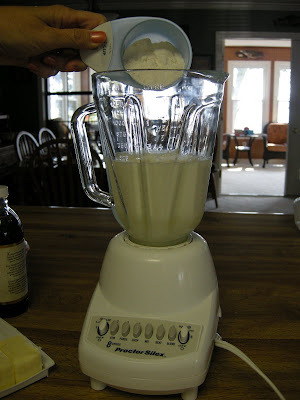 You actually mix it up in your blender! With the baking mix working its magic to make the crust as it bakes, this is a great pie to let your little ones help with so they can call it their own. 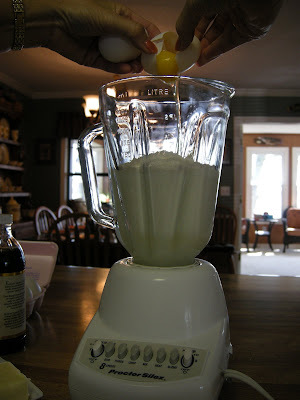 Just toss the ingredients in the blender and let little fingers push the buttons while you hold the lid on! 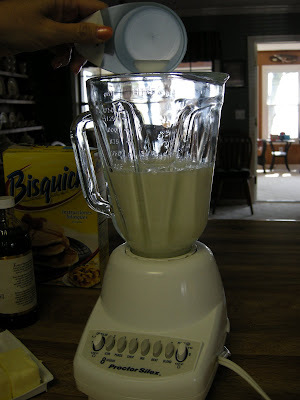 You’ll need: milk, sugar, baking mix, vanilla, eggs, margarine, and shredded coconut. See? No pie crust! It makes it’s own crust as it bakes! How cool is that? Mix on low speed for three minutes. Until it looks like this! 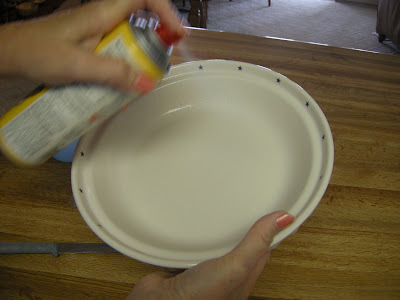 Spray a nine inch pie plate with nonstick cooking spray. 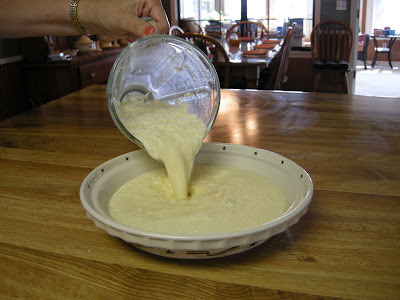 Pour batter in and let rest on counter for five minutes. 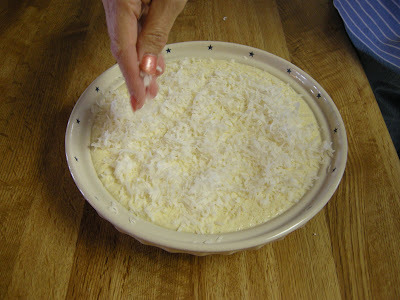 After five minutes, sprinkle coconut over top. Bake at 350 for forty minutes. 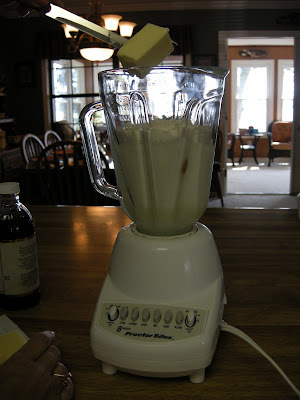 Put everything except for the coconut into the blender. Mix on low speed for three minutes. Pour into greased pie plate. Let rest for five minutes. Sprinkle coconut on top. Bake at 350 for forty minutes. Special thank you to all of you for taking the time to read Southern Plate and for all of the great praise to your friends and family. I just love getting new readers! Y’all know how I am. If there is a story attached to a particular recipe, I have to share it. With that in mind, I do hope you’ll forgive the fact that this particular recipe has a rather depressing story which goes along with it. You see, this is my favorite pie that Mama makes me. I have never actually made this pie myself, because Mama makes it for me. She doesn’t make it for my sister or my brother, or even my dad, she makes it for me. This is exactly what she was doing when I was a month away from my daughter being born. I dropped my son off at preschool and then went to visit with Mama a bit. As I got there, she was making this pie for me as a little surprise. She had arranged to go to the Aquarium in Chattanooga later that day with my sister and nephew and wanted to make this before she left so I could take it home. We visited a bit, had a slice of pie, and then both got on with our day. Later that afternoon I got a phone call from my grandmother. My grandmother’s voice sounded strange, as if she wasn’t fully aware of the magnitute of what she was saying. I stayed calm and managed to get my father and then even my mother on her cell phone. They hadn’t started cutting her out of the car yet and she was already calling me to see if I could be at the hospital when they arrived to look after my nephew since she and my sister would be with the doctors. It was a long ambulance drive from Scottsboro to Huntsville and I was there waiting when they arrived. My nephew had a few bruises and was pretty shook up, but fine. My sister was fine as well, both were released that day. Mama was a different story. As a car had swerved, likely from a driver falling asleep, it had hit the front tire of my sister’s small SUV. Most cars would have been fine with such a minor impact, but this was your typical top heavy SUV. As she swerved, it began to tip…and eventually flipping an estimated five times, the length of a football field. My mother’s door came open during this and her legs had been outside of the vehicle during the flipping (I’m really not making you want to make this pie, am I?). Her legs were broken in five different places. After a harrowing 24 hours in Huntsville Hospital in which they actually “forgot her”, I finally spoke up to the nurses and they realized that the doctor who had been scheduled to perform surgery on her legs a few short hours after she had arrived had actually clocked out and gone on vacation instead. A wonderful doctor, Lebert, stepped in and worked alongside another surgeon to have Mama’s legs filled with the needed plates and screws in order to restore them. It had been over twenty four hours, but her surgery was done in about an hour thanks to these two surgeons who stepped in. After two days spent almost entirely at the hospital, I came home to find this pie still in my refrigerator and ate a slice, grateful that the woman who made it was still alive. On a sidenote: Huntsville Hospital is filled with wonderful people. They have doctors and nurses and many other staff members who are dedicated and truly care about everyone who walks through those doors. However, it’s a big hospital and patients get lost in the shuffle sometimes. IF you have to go there (or any other large hospital), do everything possible to have an advocate with you. Long story short, after a few months of extensive physical therapy, Mama could walk again. There was a time when we weren’t sure that was going to happen. We have all been left with a new gratitude towards life and a realization of how quickly it can change – and one more reason that this pie is so special to me. Been a wonderfully busy weekend! I am going to sit down tonight and respond to comments and emails! thank you for your patience!!! Hope y’all are having a great weekend as well! I’m new to your blog so your stories are new to me…ohh my i’m in tears. Thanks for the recipe, it sounds great! Also the story was so touching. Glad your mom’s okay though. The Pie looks easy and delicious! I always need easy and quick things to make. Your story was touching. It gave me goosebumps mainly because my niece, who is more like my little sister, went through almost exactly the same thing this past February. I’ll send an email because it’s too long to display here. God Bless you Christy.. I’m glad mama is doing well. I’m gonna make this pie for my niece and tell her the story. What an amazing story! I’m glad I knew before the story even started that your mom ended up being okay – since she’s the one doing the tutorial! 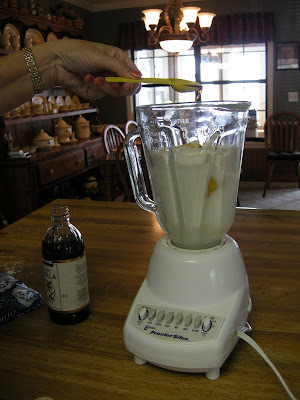 Christy I am so very glad that your Mama is ok and this recipe looks so good! I will surely be giving this one a try! I hope all is well with you! Hi, this is your Aunt Kathy. I love your blog. It makes me hungry to read it! Also, I love the stories you tell about the recipes. You’re very talented! Keep up the good work. P.S. Your cookbook is GREAT, so those of you who haven’t gotten one yet, get with it! A story behind any recipe makes it better and it had to be angels watching over your mama and that is also why she must just make that pie for you. For any other day she would have made another kind of pie but would not have had the blessing that she carried extra with her that day. And I have my own story about Huntsville Hospital and waiting from midnight until almost 6 am waiting in the outer waiting room after an ambulance took me in to find out I had broken my left arm in 2 places. But because of the timing and other scheduling, I too was assigned to Dr. Mark Leberte and he is the best of the best and unbelievable bedside manners. I have heard from others around that I got the best ortho doctor in Huntsville so God does work in mysterious ways, we all just have to have the faith in our dailey walk that he is in control of our lives. Thank you for sharing your story. Hi Christy, gosh, just another great post! Love that story and I know I will think of it and say a little thank you prayer for your mom everytime. I am having trouble with the crock-pot oatmeal. I love the idea of this being ready in the morning and I want it to turn out so bad but it just keeps overcooking. I found the Silver Palate oats but am wondering if maybe I got the wrong kind….? Any helpful hints? Thanks and keep writing girl, you have a great talent. Christy, so glad that your momma, sister and nephew were all ok. It certainly takes your day to day life and puts it in a new perspective when something like this happens to your family. This pie looks so good! My mom is up from GA visiting and I’ve come to your site this morning to find a few things to make while she’s here! This looks divine. Problem is I’m the only one in the house that absolutely loves coconut. Guess I’ll have myself a pie. BTW, I’m back. Email me and we can talk about the thing. My name is Heather and I love your blog. I read it daily. I loved your story on the pie I am so glad your family is o.k. 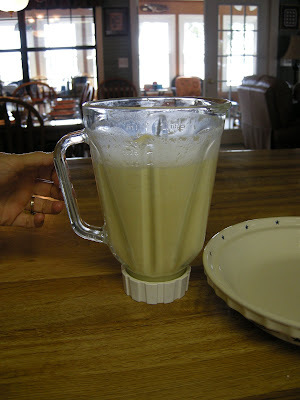 I wanted to let you know that I have tryed many of your recipes and have had great responces from my kids and hubby, thank you for that.I am a pie lover and was wanting to know if you have a recipe for peanut butter pie and buttermilk pie and also pecan pie? I plan on making these pies for Thanksgiving .Thanks and congrats on your blog success…. Oh my goodness! What a weekend! I’m so sorry to hear about your mom! I think of her every time I wear my apron she made. Now I’ll keep her in my prayers for a successful recovery. Oh yeah.. I meant to tell you. This past weekend I made yet another Butterfinger cake along with the Cream Cheese Apple Cobbler. I got two marriage proposals out of it! Woohoo! I just wanted to tell you how much I love your site! I recently moved up to Washington DC after having lived in Florida my whole life and I miss my Mama’s cooking something fierce. I knew I would miss the tea, but I didn’t know I would miss things like knowing other people who had heard of a punch bowl cake! Reading your site gives me a little piece of home everyday and I can’t tell you how much I appreciate it! Wow! So glad everything turned out okay. Another great-looking recipe. Isn’t pie grand? Christie Thank you for taking the time to ready! I appreciate all of your kindness, thank you. BillGent It really is quick and easy. Makes it’s own crust, what more could ya want? Thank you so much for sending me that story about your niece. You are right, the parallels are amazing. I’m glad we’re all okay and left with a new appreciation of moments in life that many people take for granted. Thank you, Bill. I’m honored to have folks like you in my little community. Stephanie LOL! I knew I couldn’t put that story at the front ! I felt bad even putting it at the ending but I honestly couldn’t see telling about this pie without telling why it meant so much to me. Carol Thank you so very much, and thank you for reading. I truly appreciate it. Treva I’m doing great. Had time to send you a quick email today and now I am officially caught up on emails on one of my addresses! I hope to be caught up on the other by bedtime. Thank you so much, Treva! Kathy Wow, great to hear from you! Hehe, I appreciate the cookbook endorsement, too! Hope you’ll be a regular reader from now on! If you subscribe by email you get printable versions of every recipe sent by lil ole me at the end of each week! Thank you so much for the compliments! Wooohoo!! I got more family on the site now! David You are exactly right about her making the pie that day. Mama has always “known” things from time to time and I know it wasn’t a coincidence that we had such a special morning together. I’m so sorry to hear about you and Huntsville Hospital, but I’m glad you got the best of the best as your doc in the end! It’s awful that HH has such a history to it. I sincerely hope you never have to go through something like that again. Thank you so much for sharing your story, I’m glad it had a happy ending and wish you many more. Joan Thank you so much, Joan. About the oatmeal, have you tried adding additional water to it? Do you cook it in a water bath or straight in the crock pot itself? One option is to place your oatmeal into an oven safe bowl (like a pyrex) and sit that in your crock pot, filling water up to the sides of it, then cooking. Email me and we’ll make sure you have perfect oatmeal next time, promise! April thank you so much, April. We really are fortunate and now we realize just how much. Everything is so fleeting. Oh do let me know how your Mama’s visit goes. I hope she enjoys the nice cool weather up there! Have you made hoe cake before, by any chance? That recipe just speaks to the southerner’s heart! Even if you’ve never had it before, it still somehow takes you home! Bayou Belle Hey! You know, I am the only one who really likes coconut in my house as well. I just stick this in the fridge and work on it for about a week all by myself! it’s a tough job…but I’m dedicated ! Heather Hello! Thank you so much for reading and letting me know you like the recipes! I do have the recipes you need, if you’ll shoot me an email at christy@southernplate.com, I’ll be happy to email them to you! Donna Hey! It happened four years ago, I’m sorry you thought it was this past weekend!! She is fine now, today is actually the four year anniversary of the accident. Thank you so much though. I hope you are enjoying the apron!! I’m so glad you’re here, Donna!!! Bill LOL, Bill it’s a wonder you don’t have them lined up at your door, already! I can only imagine you must live in a difficult to find area and that’s why! Teeny thank you so very much. I really appreciate you reading and this comment is just wonderful. Thank you so much for the huge grin you gave me! I do hope you continue to enjoy Southern Plate. Let me know if you have any questions or special requests! Its great to have you here! Tomato Lady Hey Gal! Hope you’re doing well! Pie is AWESOME!! I am about to go look in my pantry and see if I can’t throw one together for dinner tonight! I haven’t planned the main course yet, but no harm in working on the dessert first!!! I’m so grateful for every one of you. Yup – I bet this was good. 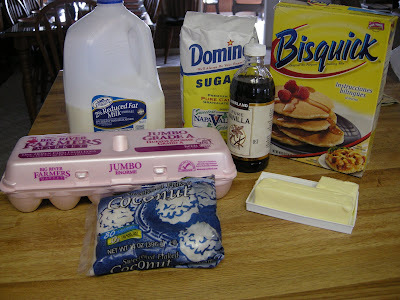 I love bisquick – it’s actually how I make my cornbread – lol. It gives it that nice “cake-like” texture that us Chicagoans love so much. Great flavors going on here – really! PS: We dont’ have Pioneer here – I’ve never heard of that before. Hey – I am an al.com follower – This recipe sounds wonderful, I will definitely try it and use my Longaberger pie plate also! Hi, I was just reading about the coconut pie recipe and that, too, was one of my mothers wonderful pies that she use to make. My Mother passed away on Sept. 1, 2008, I was with her for months. She had endocarditis and it took her in a matter of seconds. She was my best friend and I miss her so much. I wish she could make that pie one more time. I don’t even like coconut (It’s the texture, not the taste- feels like I am eating grass) but I may have to try this soon. Looks delish! Surprise company came for lunch yesterday. Threw it together in a pyrex dish as I do not own a pie plate. I got more helpings cutting them square. Went over so well, no extra left for a nighttime snack. Thank your mama for me. My Dad couldn’t get enough. I just discovered your site and I’m so glad I did – it’s WONDERFUL!! I love cooking and trying new things and so many of your recipes look delish! This Easy Coconut Pie recipe is something I definitely am going to have to try. It looks so easy and I can’t wait to see how it tastes. Thanks so much for posting all these great recipes!! Tina Our twin food history strikes again! LOL I’m glad I got someone to raid the fridge with in the middle of the night, now!!!! Darius Thank you so much!! You’re making me want to get to Chicago to taste their food now!!! So good to see you here, as always! Thrilled whenever you stop by! GASP NO PIONEER BAKING MIX????? I may have to send you some of that stuff, its awesome! I just love the canister…. Cathy Oh Cathy, thank you so much for sharing this. This pie just became double special to me now. I am so sorry for your loss. They say no matter how old we are, when we lose our Mama, we’re orphans. I know you miss her terribly, but I also know she is still with you. Folks that love us that much tend to “hang around” us. If we ever meet, I’ll be sure to bring a pie on behalf of your wonderful mother. Dreskir Wow, what a neat idea and don’t you just love throw together recipes? I’ll tell Mama you send your thanks and I’m so thrilled y’all loved it! Suzy Definitely easy and great! I wish I could give you a slice of it! It kills me sometimes that I can’t actually feed y’all!! Southern Instinct is to hand out food!!! So easy looking! I actually have all of those ingredients on hand! I’m going to have to look for Pioneer next time I’m in Publix and try it out. Thanks for sharing the story about your mom. Thank God that everything worked out okay for her! Oh my Christy! I’m just now getting to all of your previous posts since I’m a ‘newish’ member here and I was moved to tears reading about your mom’s accident and your experience at the hospital. I’m so thankful she made it okay. I’m an RN and, unfortunately, have seen my fair share of poor care in the hospital. My father fell off his roof straight on his head a few days before Christmas this past year and I remember the phone call, not knowing if he was going to make it, seeing all of his head and facial trauma……and miraculously, he’s doing just fine. I love your blog, I love your recipes, but most of all I love your stories! I ate at Bonefish Grill last week. They had a special “coconut cream pie” with rum sauce for dessert that I couldn’t resist. I was expecting something really custardy like the coconut cream pies my mother baked when I was a kid. Those were my favorite! Instead it was more solid like this recipe. It was good, just not what I was expecting. I kept thinking, “Well, heck, I could have made a whole pie easy with Christy’s recipe!” I’ll have to do that one of these days!